On the first page, a smiling frog and a beautiful pink flower bask in a pond; on the opposite page, “Huge tires / Of a / Camouflaged / Vehicle are /About to / Squash / Them flat.” Then the destruction intensifies: something drops from the sky on a Latino boy dreaming on a haystack. Images of eyes greedy for oil give way to a stark picture of mothers and babies buried beneath swirling, tactile streams of waste. The communities are always idyllic, with no hint of poverty or struggle, but the activist message and sometimes frightening images will compel children to talk about what they feel and see. 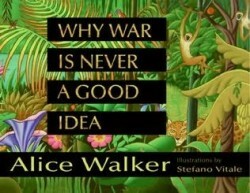 Pulitzer Prize-winning author Alice Walker talks to WNYC’s Leonard Lopate about why she wants to teach children about the graphic horrors of war in her new kids’ book, Why War is Never a Good Idea. You can hear the audio track of the whole 17-minute interview by launching the audio player below.